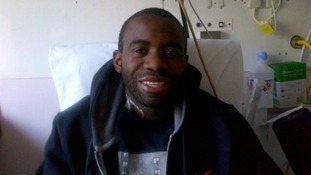 The fiancee of Fabrice Muamba has released a photograph of the Bolton midfielder in his hospital bed, as he recovers in hospital. Fabrice Muamba's father and fiancee have expressed their "enormous gratitude" to the Bolton and Tottenham medical teams for their quick reaction after the player's heart attack on Saturday. In a statement, they also praised the "fantastic team" caring for him at the London Chest Hospital. The Bolton Wanderers manager Owen Coyle has said everyone at the club is astonished how far Fabrice Muamba has come following his heart attack on Saturday. But he added: "We have to stress he is still in intensive care and he is still seriously ill. He has a long way to go." When Fabrice Muamba collapsed on the pitch the whole stadium fell silent and stood still. Apart from this man, who will now forever be known as the doctor who came to the footballers aid. Here he describes just how he came to be on the pitch. The FA Cup quarter-final between Bolton and Spurs, which was abandonded following the cardiac arrest suffered by Fabrice Muamba on Saturday, will take place on Tuesday, March 27 at 7:30pm at White Hart Lane, Bolton have confirmed. 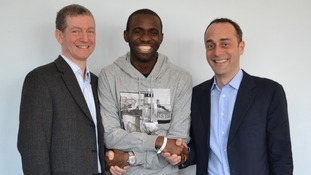 The club have also confirmed that Saturday's Premier League encounter with Blackburn will go ahead as planned just as their club doctor was giving further good news on the progress of Muamba. Bolton fans have been invited to the Reebok Stadium to pay their respects to Fabrice Muamba who collapsed at White Hart Lane on Saturday evening. Bolton Wanderers supporters are invited to attend the Reebok Stadium for quiet reflection and prayer in support of Fabrice this evening.